I don’t know how old our dog Posey is. She’s a rescue pup that we found at the city shelter back in 2011. We took her home, somewhat unexpectedly, that same day. 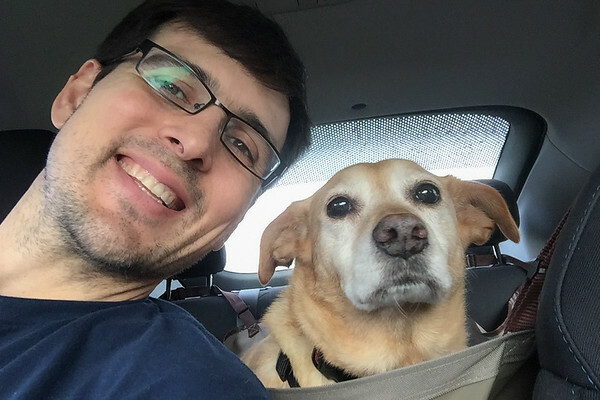 It was Super Bowl Sunday, so every year at about that time we celebrate (our oh-so-creatively-named) birthday alternative, “Dog Day,” by taking her on a dog-friendly road trip or outdoor adventure. 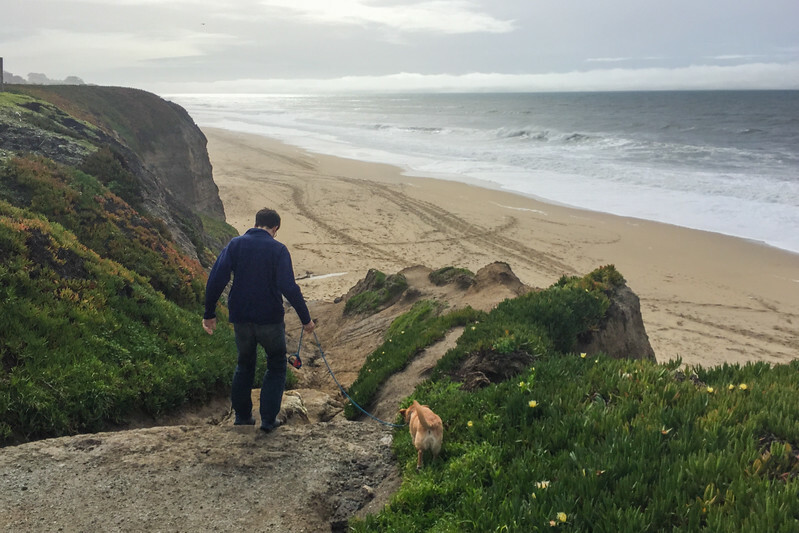 This year we decided to hit the beach and head over the hills to Half Moon Bay, California. I hadn’t been to the town in a while and I’d heard that they opened one of my East Coast favorite indulgences, Dunkin’ Donuts Half Moon Bay late last summer. 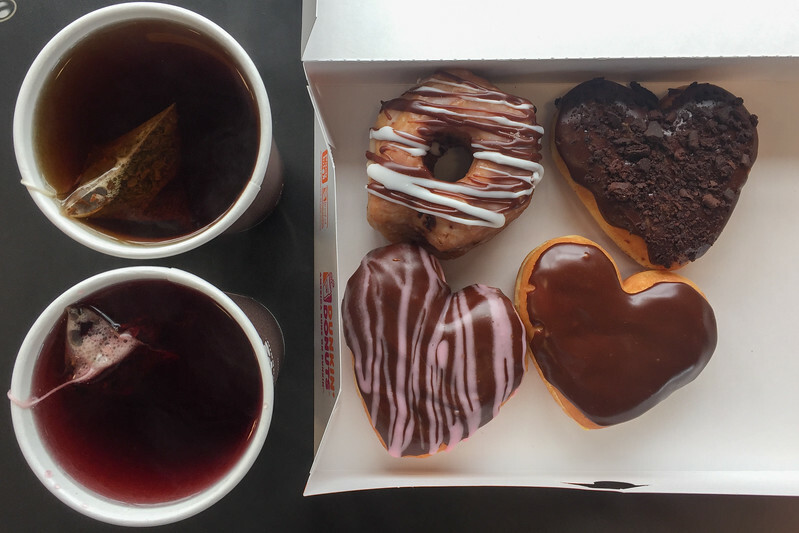 I have fond memories of Dunkin’ Donuts from growing up in Pennsylvania and New York State where they are on every corner in almost every town. 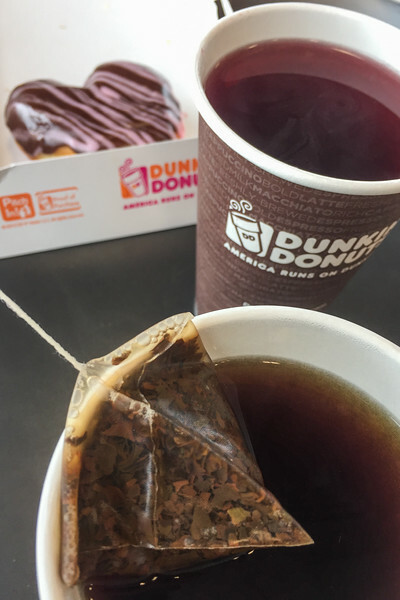 Dunkin’ coffee (and their Boston Kreme donuts!) fueled my college years. 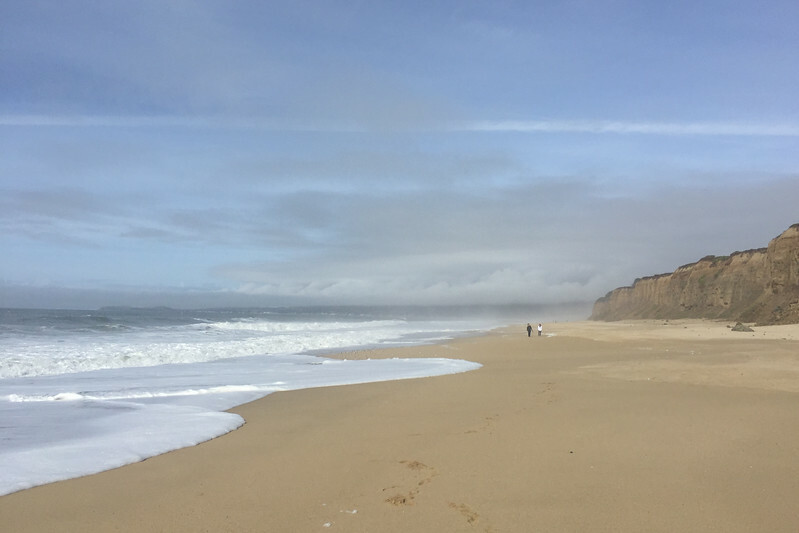 This new location in Half Moon Bay is one of only three in the Bay Area, the others are in South San Francisco and Walnut Creek. This time, though, I wanted to try their tea. I’d heard that they had just introduced a new line of premium teas–full leaf teas packed in large pyramid-shaped tea sachets that let the tea leaf fully expand. I’m pretty picky about tea and I thought this was a welcome addition to their menu. We shared two different blends–Bold Breakfast Black Tea blend, for my morning caffeine, and Hibiscus Kiss, a caffeine-free herbal infusion. They were really good, especially the herbal blend which was a nice mix of hibiscus, lemongrass, and berries, and much nicer than most of the tea you’ll find at chain restaurants and cafes. 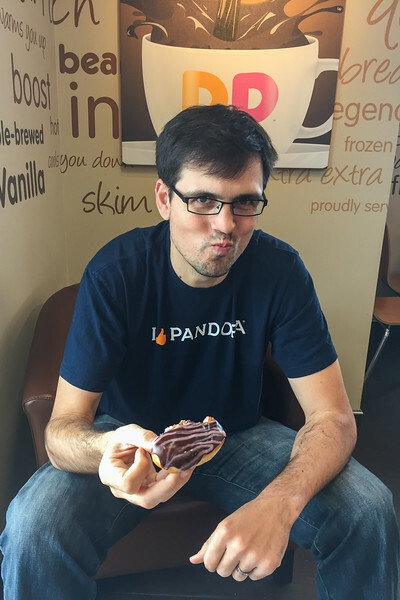 The shop has a full menu (including breakfast sandwiches, available all day) but I couldn’t resist the donuts! 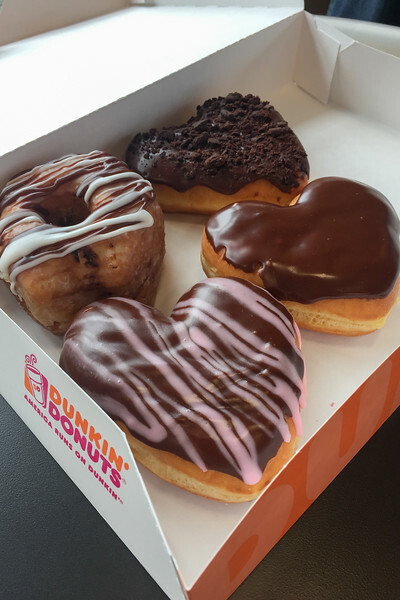 Especially when I saw that some were baked into a heart shape for Valentines Day, including my old friend, Boston Kreme. 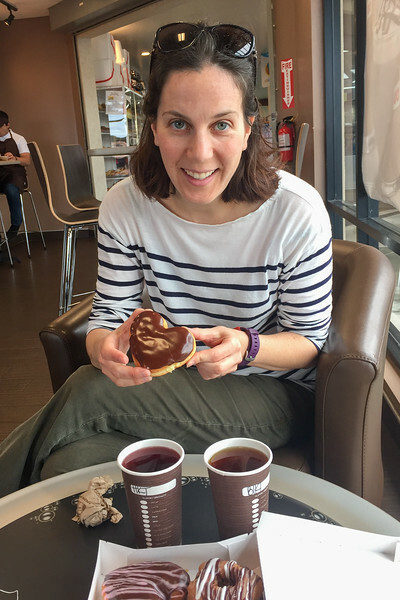 We also tried some new and seasonal donuts: a fudge croissant donut, brownie batter crumble, and a raspberry filled donut–Breakfast of Champions. 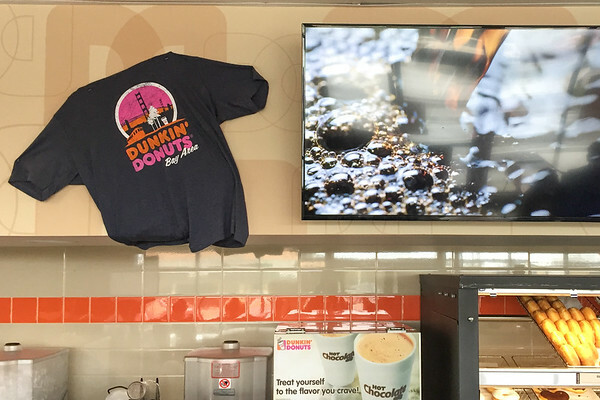 I spotted a “Dunkin’ Donuts Bay Area” t-shirt, complete with a streetcar, palm trees, and the Golden Gate Bridge! I really wanted one but they said they were sold out. Next time! Afterward, we were back to Posey, waiting patiently in the car, to head to the beach and walk off those donuts. 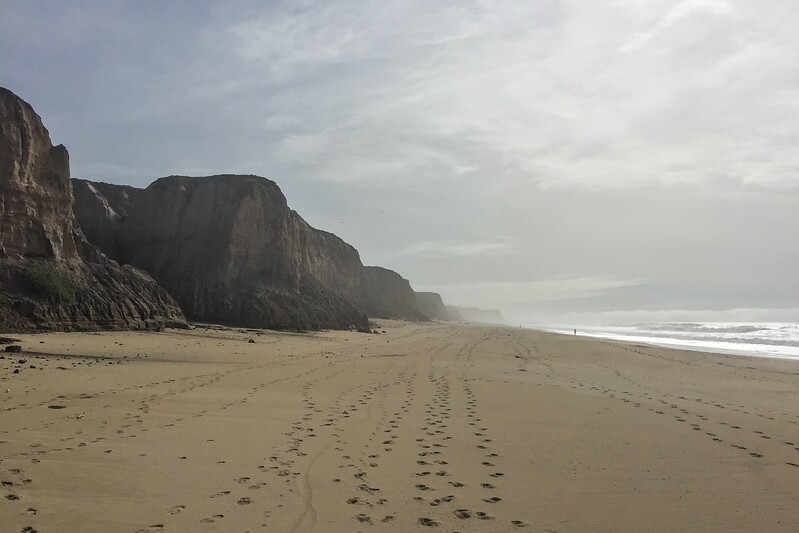 My favorite thing about the Northern California coast from Santa Cruz north to San Francisco, are the rugged, sandy cliffs. Richly colored ice plants spill over the side and the horizon disappears into the fog. There is a scenic paved walking and bike trail that runs for miles along the top of the cliffs. 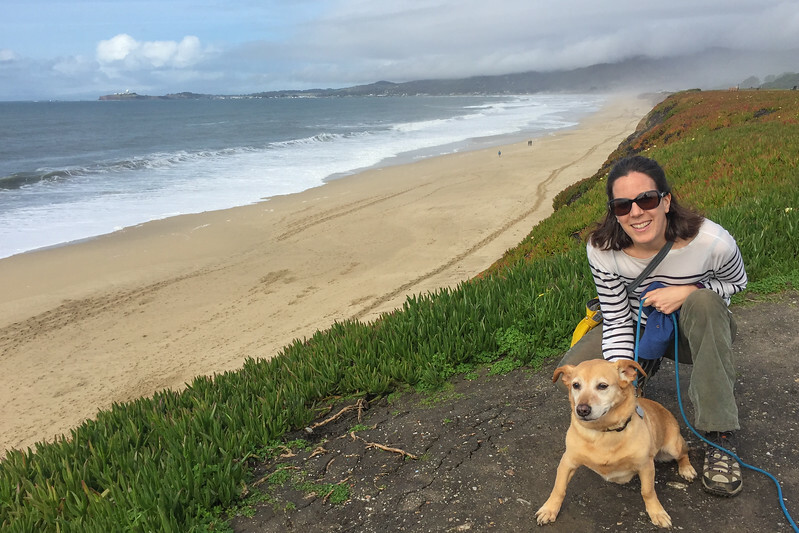 I’ve always wanted to walk it, but when I have Posey in tow, I know she can’t wait to get to the beach. 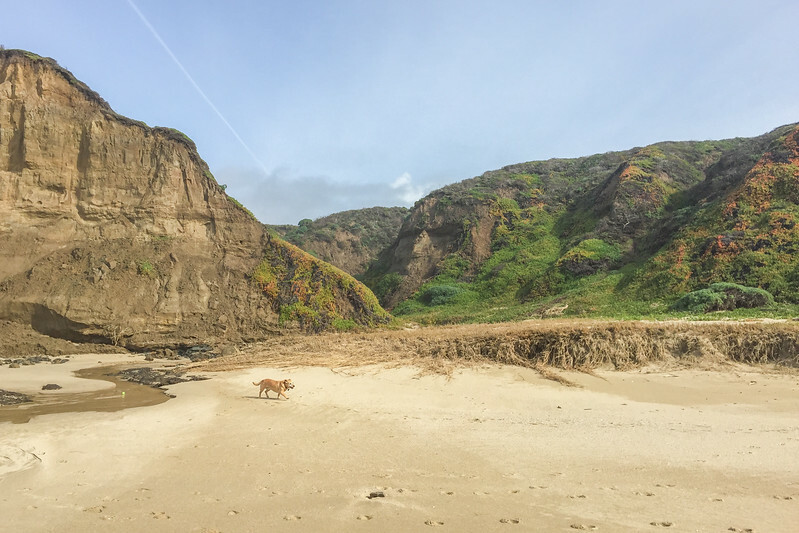 We hiked down a trail that was a bit challenging to access–it was muddy and rutted from recent rains–but we were rewarded with a stretch of beach that we had almost entirely to ourselves. The Northern California coast has been ravaged by this year’s powerful winter storms. 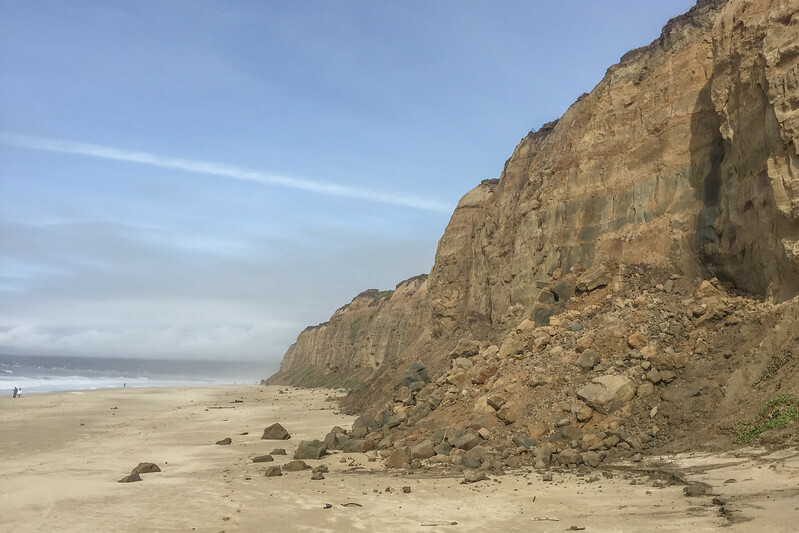 In some places there were Cypress trees seemingly hanging from a thread over the cliffs and others where the land had slid, spilling massive piles of rocks down onto the beach. It was a good reminder to be careful at the top of those sandy cliffs and not to go anywhere near the edge when posting for clifftop selfies. 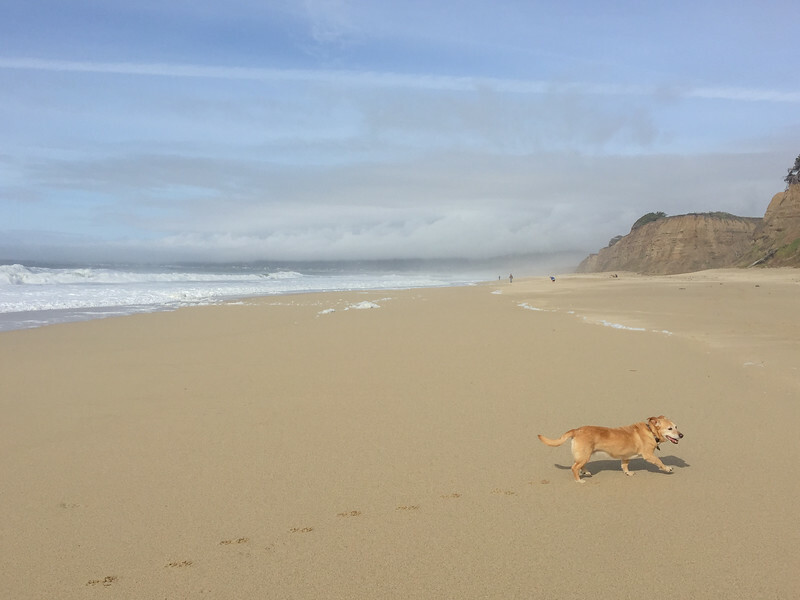 This particular stretch of beach does not officially allow dogs to run off-leash (there are no off-leash dog beaches that I know of along this stretch of coast), but we let Posey run for a bit when we saw no one was around. 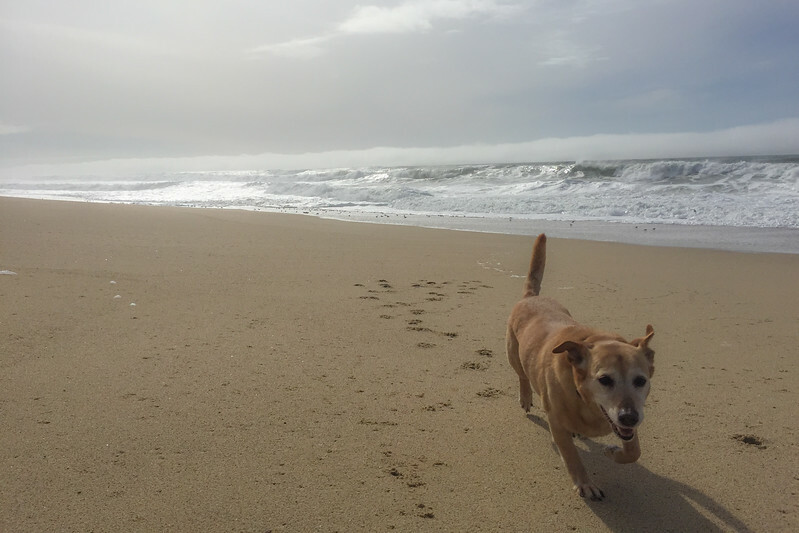 We watched her run after passing dogs, wind-blown balls of sea foam, and dig happily in the sand. A successful Dog Day, what do you think? This post was sponsored by Dunkin’ Donuts. All photos and opinions are my own. Love that last picture! Such a happy girl! Succesful dog day indeed! 🙂 Happy posey!